Couldn’t have made my day any better! This venue was beautiful. I fell in love the minute I walked in. The rustic look was exactly what we were going for. The food was delicious, got plenty of compliments about that. The service from everyone around was great. They all made the day perfect, the perfect weather helped too. We picked the end of March, which you’ll never know what you may get in NJ, but it was 70s and sunny. We had the ceremony outside. We were able to open the doors where the cocktail hour was held to have some nice air flow and beautiful scenery. The reception room worked out lovely for our 130 guests. Definitely one of the best venues all around! Sky View is absolutely perfect. We immediately fell in love with the place when we first visited. It’s a beautiful venue inside and out. We got married on October 28, 2018. We had Michelle and Hildegard as our Maitre’d’s and they were wonderful. They were very attentive and made sure we had food and drinks all night and took care of literally everything for us on our big day. There are so many food options for you to choose from for your cocktail hour and everything including dinner was AMAZING. I can not recommend Sky View enough. Thank you for giving us the best day of our lives! Not only was Sky View breathtakingly beautiful, but its staff directly contributed to making our wedding the best day of our lives. From the beginning, Rafael and his team were friendly, easy to work with, and gave us confidence that our wedding would go off without a hitch. The food was outstanding and exceeded all expectations. Our guests are still talking about all of the wonderful food they enjoyed at the wedding. We can't thank them enough for giving us the wedding of our dreams. We highly recommend Sky View Golf Club! 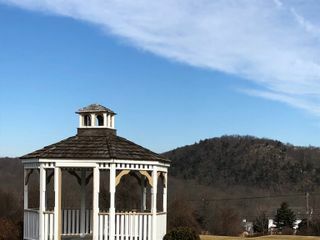 Skyview was a wonderful place to get married! The view is absolutely gorgeous, and although it didn’t rain on our wedding day, if it had, their backup plan gives you the same view as outside. We were treated like VIPs the entire day, with Michelle and Hildegard making sure that everything was perfect and that we never wanted for anything. Every 20-30 minutes one of them was checking in with us throughout the reception to refresh drinks or make sure we got our plates from the buffet without being crowded by our guests. I was even able to send a couple guests to the bridal suite who were not in the bridal party when they needed to get away from the reception for a few minutes. All of the waitstaff is wonderful and friendly, and unobtrusive. We even had some help getting our pictures from the golf staff, and they were friendly and very helpful as well. I would highly recommend Skyview to anyone looking for a place to get married. This venue is a hidden gem! The owners and staff are simply amazing--their team at SkyView was spectacular to work with! Not a detail out of place-- the staff was attentive and courteous. Nobody had to wait in line for any food or drinks the entire night. The food was delicious! The team was also especially helpful in accommodating my fathers wheelchair around the venue and making sure he was comfortable. I will be recommending everyone look at this venue-- its a hidden gem! They made our day perfect and exceeded our expectations. I couldn't have dreamed for a better day! SkyView is a beautiful venue with gorgeous views! I got married there on 9/15/18. The moment my husband and I saw it we knew that’s where we wanted to get married. We fell in love with the venue and booked it before the renovations. When we saw the renovations after they were done we were blown away at how amazing it looked! We worked with Michelle throughout the wedding planning process. She was very helpful and responded quick to emails and answered the many questions we had during planning. She was very accommodating especially when we wanted to add a live painter and food truck to our day. I would advise other brides to schedule a food tasting way in advance. We emailed Michelle at the end of May to schedule a tasting but were told the only dates she had available were at the end of July which was too late since we were getting married that next month. Overall the day was beautiful! The morning of our wedding Rafeal was there to assist with set up and make sure everything was going smoothly. Before the ceremony two women, Lindsay and Hildegard, organized the bridal party in line to walk down the aisle. Everything went off without a hitch! During the cocktail hour Michelle and a few other attendants brought us food and drinks so we got to eat and enjoy the food! The food was plentiful and incredible and we had a ton of options to choose from. The staff was professional and polite and very helpful the day of and throughout the entire planning process. We couldn’t have asked for a more beautiful venue and professional staff! Overall, we were very happy with SkyView and would recommend to anyone looking for a rustic, romantic venue with beautiful outdoor views!! 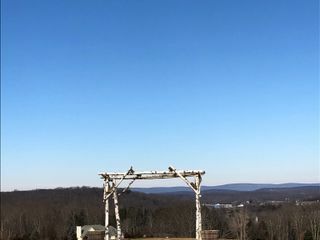 I'm so happy we chose Skyview for our wedding on 9/8/18. Michelle was a pleasure to work with and was so helpful in answering questions in the months leading up to the wedding. The venue is beautiful with great views throughout the golf course. My guests were blown away by the food, I kept hearing comments about it all night. Unfortunately we had some rain on our wedding day so we couldn't take advantage of the outdoor ceremony area, but they set up a beautiful indoor ceremony for us in the ballroom, which was so nice with the fireplace lit. The day of staff was wonderful as well - they made sure we ate throughout the night, and made sure we always had something to drink. I would 100% recommend Skyview! Everything went so well!! The venue is gorgeous and the bridal suite is great and the lunch provided was just enough. Loved that during the whole day I was asked if I needed anything! Very personalized and wonderful experience! I’ve already told my friends they need to get married there! This is the best choice that we made for our big day on July 21st, 2018! Michelle and her team were awesome to work with! They were very responsive to the weather changes and flexible. The wedding went above and beyond our expectations! Michelle and her team were amazing to deal with. It was a very special and stressful day for us but the entire team was very supportive and helpful all throughout the entire day. From start to finish Michelle and her team were extremely patient and accommodating to our needs. Thank you greatly for all you've done from the bottom of our hearts! Skyview made mine and my husband’s wedding day unforgettable! Rafael, his wife Michelle, and the staff at Skyview Golf Club were outstanding. My husband and I can’t say enough great things about the amazing service we received. We definitely did not go hungry at our wedding. The team made sure we were fed and having a great time with all our family friends. 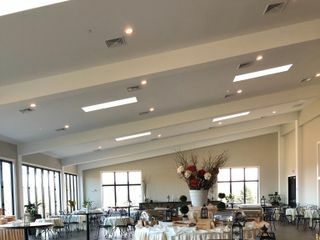 The recent building renovations are stunning and we received so many compliments from all of our guests on how beautiful the venue was and how amazing the food was. I would recommend this venue to any bride! Perfect, perfect day!! We got married on 6/29/28. Could not have been any more thrilled with the planning process and day of! Michelle was quick to respond and eager to help. The day went just as planned and I had nothing at all to worry about. 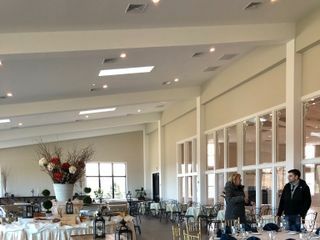 My husband and I had our cocktail hour in the ballroom and our reception on the new patio. It took a bit for our band to adjust their acoustics because of the sound bouncing off the windows, but aside from that everything was PERFECT. Guests raved about the food, service, and the view. We could not be any happier with our wedding day! Our experience with SkyView Golf Club was simply phenomenal!! The venue itself is GORGEOUS. The photos do it no justice, so it’s worth taking the trip up there to see it with your own eyes. As soon as we pulled into the parking lot, we knew this was where we’d be having our wedding. The reception space is recently renovated and is absolutely stunning. The ballroom is larger and has all hardwood flooring, which we loved, and the new cocktail hour space is so spacious and beautiful. Both rooms have floor-to-ceiling windows, so you can see the beautiful landscape even from the ballroom. Michelle was with us through most of the process, from our very first visit to our wedding day, and she was so, so amazing! Leading up to the wedding, she always provided a ton of information and answered all of my e-mails quickly and thoroughly. She is very detail-oriented and made sure every last piece of our wedding day was exactly how we wanted it. Because of her, the day went off without a hitch. Our other maitre d’ Lindsey was also fantastic! Once the reception started, she took care of us from start to finish. She got us food and drinks at cocktail hour so that we could socialize, and she always offered to get new drinks even if ours were just warm, not empty. The most impressive thing was that my husband told her the #1 thing he wanted to do at the wedding was eat dinner - well, we happened to be outside taking sunset photos when dinner was about to be served, so she RAN out to meet us and let us know. I was so grateful that she really took to heart our requests and made sure we were 100% happy with our day. Overall I definitely recommend checking out SkyView for your wedding! 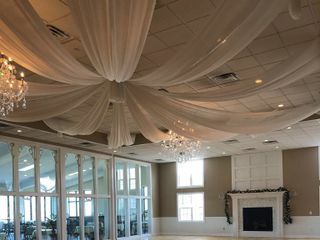 It was gorgeous, the food was delicious, the service was out of this world, and it was pretty affordable as far as New Jersey golf club venues go. Michelle and Rafael were both so amazing! They were quick to respond to all of our questions and needs. They both worked so hard along side us to make sure our day was extra special. On the day of the event they were both so helpful, Michelle was my guardian angel keeping me calm during the whole night. The venue was absolutely amazing! All of the staff was great and we are beyond grateful that we picked such an beautiful place! I highly recommend Skyview! I'm looking forward to the next event we plan here! The venue is beautiful. Just enough sparkle and bling. All of our guests were amazed by their professionalism and attentiveness. The venue allows for various photo opportunities - all on site. We could not do our ceremony outside; however, the set up inside and it was beautiful. They used my decor to help line the isle & it was so romantic. On point, very well planned out and organized! Could not have been happier! From the very first meeting, my wife and I knew that SkyView was the correct choice for us. From the beautiful views to the professionalism of the staff, we can say that it was the perfect venue. Our coordinator Michelle was attentive, fast with responses, great with recommendations and overall a pleasure to work with. Leading up to our big day, Michelle and her staff were great with prepping us and working with our other vendors to ensure our day was a success. During our wedding day, the staff went above and beyond in creating the perfect experience. Michelle even made us small plates of food and grabbed us drinks from the bar while we were otherwise preoccupied. 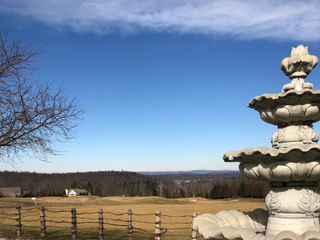 SkyView truly provided a wonderful experience from start to finish and we would recommend them to anyone who is searching for their wedding venue. We had our Wedding at SkyView Golf Club on October 14, 2017. Rafael and his team worked tirelessly to make sure our day went off without a hitch. We had several special requests that they worked with us on to make sure that we were happy and we couldn’t have been more so. The team at SkyView are true professionals but also took the time to get to know us as we spent several hours on the grounds beforehand. Special shout out to Lindsay who was the bridal attendant for the day – she made the bride’s day carefree and made sure they always had everything they needed. The venue, its spectacular views, and wonderful staff are highly recommended. You will be happy you decided to have your big day there – we really are. I cannot thank Michelle & the entire staff at Skyview more. One of the biggest questions I got after my wedding was... so how many things went wrong? And I got to say, absolutely nothing. The entire day was on schedule & stayed that way right down to the last dance. Michelle was right there every step of the way to first guide us all down the aisle, then into the cocktail hour, lining us up for intros.. everything. I literally didn’t have to worry about a thing. I received amazing feedback on the food, and the style of service we had... most of my guests had never heard of or been to a grand cocktail reception and everyone absolutely loved it. The taco bar was amazing! 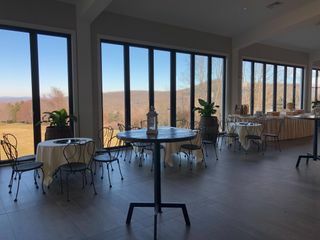 Skyview is just so gorgeous and so perfect in every way from their rustic barn,, log cabin, and then their beautiful ball room, coupled with the amazing food and service, getting married here should be a no brainer! Absolutely fantastic all around! Thank you so much for making my wedding day the most flawless, beautiful day that every bride dreams of! We got married here on April 28, 2017 and could not have been more please with how the day went! We fell in love with the venue the second we walked on the property and knew this was where we wanted to get married. Michelle was so helpful and flexible throughout the entire process; you couldn't ask for a better maitre d! Our guests had the BEST time! Everyone raved about the food, the views, the reception hall, the terrace, the staff .. EVERYTHING! (Even the one guest who said they roll their eyes at least 5 times at weddings said this was the best wedding they have ever been too! And with no eye rolling!) Michelle made the night go super smooth and was always there if you needed anything like food or a drink to make sure you weren't missing out on anything! She even sent us home with extra desserts that we didn't have time to eat. Her and Rafael also helped us out with getting a golf cart after they were locked up for the night so that we could drive over to get some twilight shots at the silos which we really appreciate because we got some awesome pictures out of that! I could go on and on about how perfect the day was and how much we appreciate what the staff did for us! If you're looking for a venue.. this is the spot.